And token druid is tied together now. Obviously worse than Mark of the Lotus. But as Dean said, there is a lot of room to be worse than Mark of the Lotus and still be a good card. Kinda slow, but this is the spell token druid needed, so this will definitely see play. The twinspell mechanic makes the spell scary, because you have to be always wary of minions getting big. 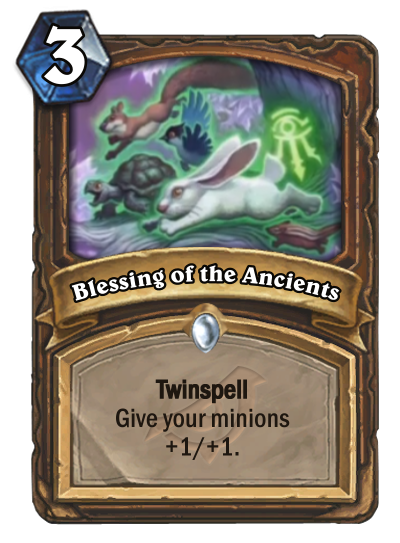 I bet Blessing of the Ancients cost 2 mana and the devs thought it was too cheap. Token druid vs secret paladin, what will be the winner? Seems strong on paper, but I think it might be way too expensive. You definitely need to be ahead on board to get value from it, hit atleast 3 minions. And it is just not as flexible as Mark of the Lotus, because of 3 mana, you might just fall behind and get nothing of it. A very "win more" card. I think the cost of 3 is because it's a twin spell. If it cost 2, you could get +2/+2 to your board for only 4 mana, which is too strong. The old druid epic that cost 7 used to be +2/+2, so it's a slight discount compared to that, plus with Violet teacher, it makes 2 tokens. Overall, another good boost to token druid I think. This is SOOOO good. Token druid needed this since Branching Paths is rotating out. Now my only question is: which token druid is going to be the best. Regular, treant or mech. My money is on mech, it has the most staying power, the best buffs AND it can deal face damage the most easily. I would guess that it will be a combination of the best parts of each. This is pretty much garbage tempo. Compare to Branching Paths for example, 2 more mana and you don't have the additional room for choice. It's extraordinarily overcosted. On the other hand, Token Druid will use it anyway as it wants the effect no matter how overpriced it might be. Funny mark of lotus saw some play but not alot. Jade's were just too OP. The card I wish paladin got. Even and Odd decks aside. Like someone else said, this might have costed 2 mana and Blizz nerfed it to 3 mana during playtesting. It's still a great card because it's twinspell so you can use it twice. It's a permanent 1/1 buff unlike savage roar which is usually only played when you have lethal or you must trade up just to survive. if token swarm is viable, the more of these the better. Why does it cost 3? I believe 2 would have been correct, and could possibly have saved the class. 3 is probably just too slow and weak, even with the double cast. Easy meta defining. Will Push token Druid with the carpet to Tier 1.